River Island are a brand that have really turned it around. When I was younger it was the shop everyone went to to cover themselves in lycra - now, it's a very different story. Here is a fantastic work blouse for a bargain £30. Lovely to see this company not follow the trend and charge above average - there was a very interesting article on the Daily Mail site today about the high street charging fortunes for concept pieces within their collections (read it here) - makes me so angry when they do this, as the whole point of the high street is accessible fashion. 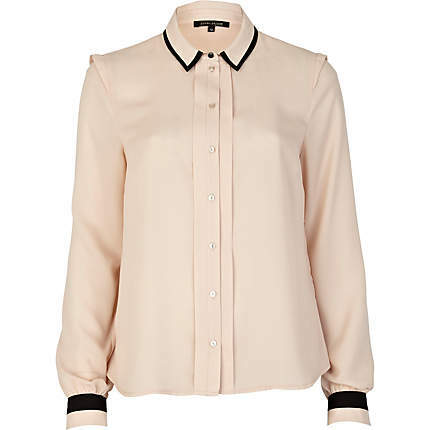 Anyway... back to the shirt - it reminds me of the shirt Kate Middleton wore in her engagement photos (here) but is about £100 cheaper. Lovely. What a great shirt for work, I may have to pop in on my way home. Love the British high street - best in the world! I still own a fabulous River Island blazer that I bought for a job interview way back.... the brand does seem to be changing, it was all a bit hit and miss when I visited back in the UK, but I would always return, because of my wonderful blazer. 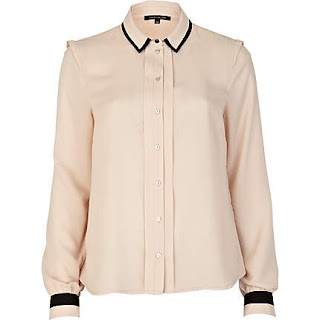 This is a perfect blouse for work, I agree. Oh my, this shirt is exactly what I am looking for ! !